This wire poinsettia pendant from Step by Step Wire Jewelry assumes knowledge of basic wireworking techniques like twisting wire and coiling wire around a mandrel. It is constructed in sections–an inner row of petals, a middle row of two twisted wires, an outer layer of leaves using coiled wire, and a center with crystals and freeform wirework. 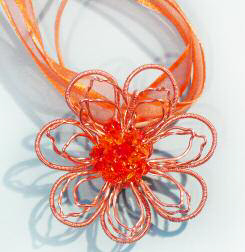 String the finished flower pendant on a length of ribbon and a waxed cord. This project will be free for a limited time.